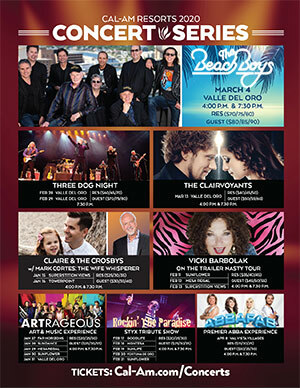 Cal-Am Resorts is pleased to present our 2020 concert series featuring The Beach Boys, Three Dog Night and The Clairvoyants 2011 runner up of America’s Got Talent. Also joining our line up will be Claire & The Crosbys with Mark Cortes (The Wife Whisperer), Vicki Barbolak On the Trailer Nasty Tour and ArtRageous-the Art & Music Experience. Popular Tribute Bands to Styx and ABBA will round out the concert series. Cal-Am Resorts also features a broad array of classes and events to tempt your palette, make you laugh and learn a new skill. From plays, to fitness to food, you’ll find more ways to be entertained and challenged than you ever imagined. Click on the button below to see our full list and to order your advance tickets.